Since using iphones typically isolates people within a party context, Andy Pratt at Funny Garbage conceived of a gaming experience that would unite people and foster a collaborative spirit. Knowing the game had to “hold it’s own at a raucous party,” Andy knew the game had to be silly and a good conversation starter. He had me look to Wacky Packages, Ren & Stimpy, and various other childhood ephemera for inspiration before I proceeded to design and animate most of the game. The result is The World’s Largest Digital Gobslopper, an incredibly silly yet addictive party gaming experience! Once the game was finished being designed it was tested at a sister agency’s party, where dozens of people collaboratively licked their way through a huge projected Gobslopper. It was a succulent success! 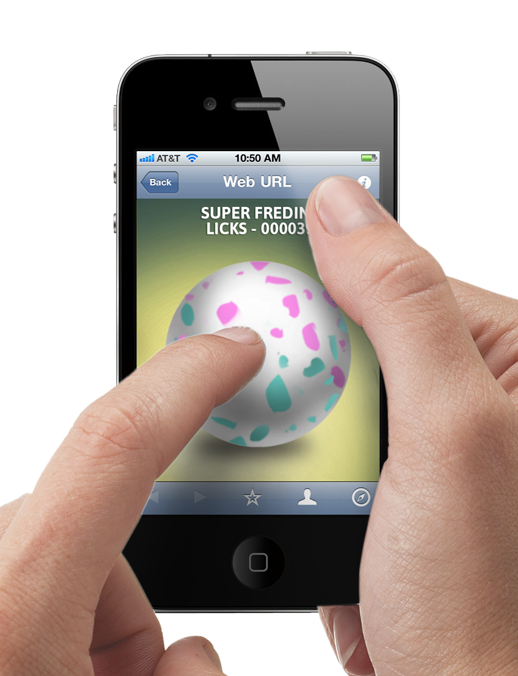 Swipe the image of the Gobslopper on your iphone to get you tongue to start licking! Main screen is projected from computer on to wall of room. Your tongue will join the group in a massive licking event, to get to the center of the World's Largest Gobslopper. Your unique tongue appears on the projection.